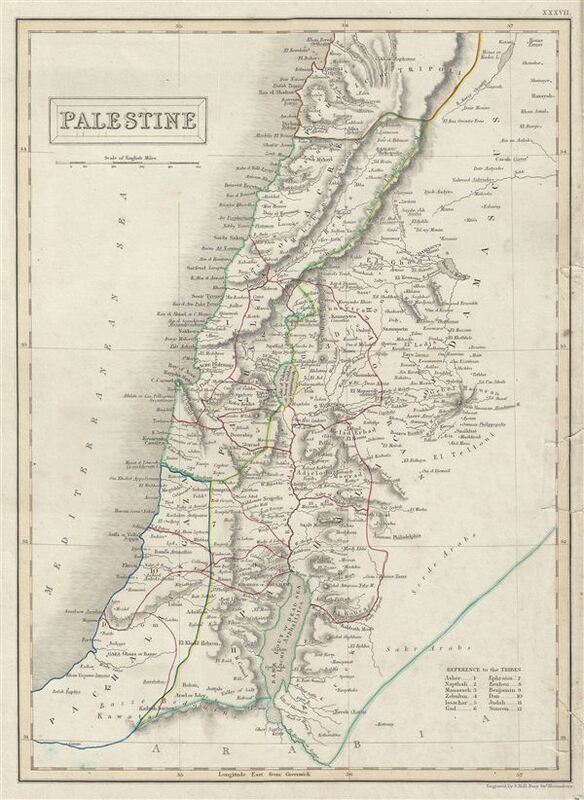 A fine example of Adam and Charles Black's 1840 map of Palestine or Israel or the Holy Land. The map shows the administrative divisions of the Ottoman empire which include the Pachalic of Gaza, Pachalic of Acre, Pachalic of Damascus and part of the Pachalic of Tripoli. This time in history marks the decline of the Ottoman empire. After the conquest of Palestine by Muhammad Ali's egypt in 1832 following the egyptian-Ottoman War, British intervention returned control of Palestine to the Ottoman rulers in 1840 which lasted till World War I. This map was engraved by S. Hall for issue in the 1840 edition of Black's General Atlas. Very good. Blank on verso. Original platemarks visible. Slight staining. Damage to right margin with verso repair at five places, each extending to approximately 1 inch into right margin. Rumsey 2305.042 (1854 edition). Philips (atlases) 4334.